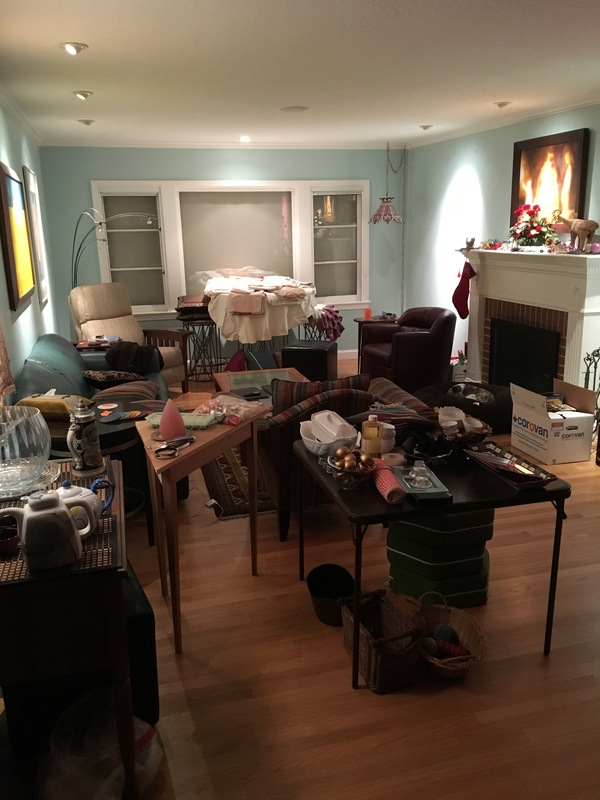 In a previous post (titled “Becoming Un-Possessed“) we talked about de-accessioning – simplifying our lives by eliminating the majority of our possessions. Starting with our house. This post is about our efforts to give some of our excess belongings to family and friends. On the Sunday following Christmas we held a Potlatch (a gift-giving ceremony practiced by indigenous Pacific Northwestern peoples where you gain status by giving possessions away). Once we’d identified the subset of possessions we plan to keep, we wanted family and friends — people we know — to be the priority for transferring our possessions. We encouraged folks to just take things they liked or to give us a token amount for the more valuable items. Our focus was not on maximizing the resell value of these items by selling them on Craig’s List (or on increasing our social status). For us, the goal was to share our non-essential things with folks we know. Folks who will think of us when they use or simply admire something we’d once owned. The Potlatch unfolded over the course of about six weeks. Before the big event we invited family members and close friends stop by for private showings. We encouraged folks to “stake a claim” on items, but hold off until after the holidays since we were going to need some items for Thanksgiving and Christmas Eve. We tracked what was going where via online files, but we made it easy for folks wandering around the house by using stickies to distinguish between “Keepers”, “Already Promised”, and “Available”. We also had a category of “Available for Fostering” (mostly art) that we want friends and family to enjoy for a while rather than putting into storage for the 2-5 years until we settle down. Except for one instance where we double-promised a piece of art, it really worked well. But as you can imagine, our house looked ridiculous for several weeks. Once all the items were gone and the walls were bare, the stickies were little reminders of what had hung where. As you can imagine, the potlatches were weird for everyone. During our family holiday dinners we encouraged family to wander around the house to identify things they might like to have. It was just plain awkward. As much as we wanted them to take things (and it really did make us happy when they asked for something because it would “keep it in the family”) we all recognized that it was akin to going to an estate sale and having the still living owner trailing along behind you. We did successfully encourage all family members to take something. Not surprisingly, our friends and colleagues felt the same way. There was a fair amount of reticence about taking things, but folks typically warmed up to the concept – particularly when we’d say, “Here, take this. We really think you’d like this. There were many items (often kitchen-related) that folks were absolutely delighted to take with them, and those were “easy sells”. Ultimately a decent set of things found new homes, though it was perplexing that certain things didn’t go. “Really? No one wanted this? It’s awesome! How could no one want this?” It wasn’t even weird stuff like the huge red painting with freaky monster things painted by Canadian artist Norval Morrisseau. And how come all the Disney ornaments didn’t get snapped up? Although we didn’t keep detailed track of which friends and colleagues ended up with new possessions, we can easily account for 39 different households who now own something we once owned. That’s pretty cool! A few folks have sent us photos of their new possessions “in situ” which is definitely fun. Most folks came to our house to pick up their new belongings. One of the few that didn’t happen at home was also the most odd. A work colleague mentioned in FaceBook that each year his family watches “A Christmas Story” together. Coincidentally, I was planning to part with my “official Red Ryder, carbine action, two-hundred shot range model air rifle” (apparently guaranteed to make you shoot your eye out). He was very enthusiastic when I offered it to him. We never managed to connect during winter break, so we needed to exchange the air rifle at work. I really wasn’t all that excited about walking around Stanford campus carrying a rifle (even if it is just an air rifle). I ultimately jammed the rifle (in its case) half way into a box and carried that from my parked car to my office. It’s been sitting in the corner of my office for a few weeks. I’ve had to answer a few, “Huh, that kind of looks like a rifle case. What’s in there?” questions from staff. As of this writing, my colleague hasn’t yet picked it up. He’s planning to carry it home on on the commuter train. Interested in hearing how that turns out! One of the benefits of folks taking stuff away was that it “went away” which meant we didn’t have to pack it, arrange for a consignment center to take it, or toss it. Even so, the logistics of packing or getting rid of all the remaining stuff was overwhelming. In a future post we’ll talk about the complex logistics of packing things for long term storage, setting aside things for our TransAm, packing kitchen and work clothes items for the two months we’ll spend in an apartment before I retire, packing and prepping items to go to consignment/donation, or piling stuff into several bags to be tossed.